The release of the latest industry forecasts by the Australian Construction Industry Forum (ACIF) illuminate a turbulent next ten years as the Australian economy recalibrate from a once in a lifetime peak, with some sectors set to experience a fall in work demand of up to 40% in the coming years. “Now that the peak has passed, opportunities for the industry’s 1.1 million participants are simultaneously softening and relocating, however it is not all bad," Folkestone Head of Funds Management and ACIF Construction Forecasting Council Chair Adrian Harrington said. 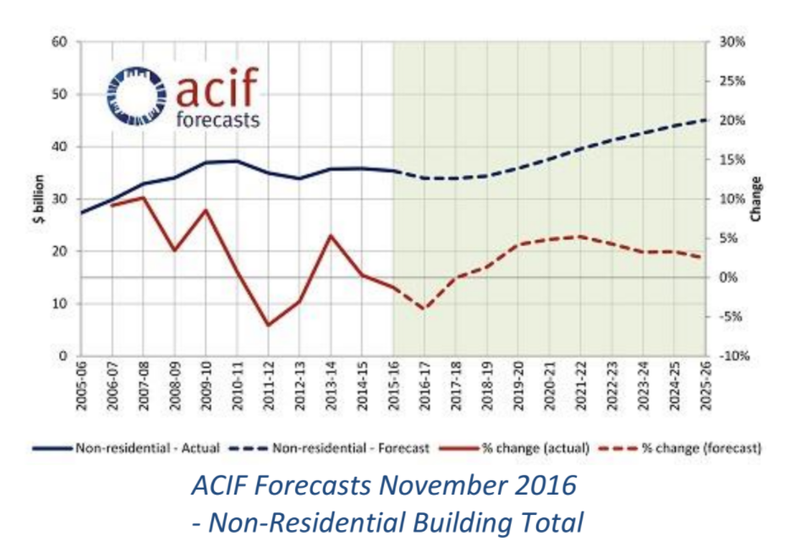 The November 2016 ACIF Forecasts project a 6% fall in overall building and construction activity from $220 billion in 2015-16 to $207 billion this year. However, this mild decline is far from uniform, and the headline numbers mask the shifting demand within each of the three sectors. There is evidence that the surge in Residential Building, especially the construction of apartments, has saturated demand, or is about to. 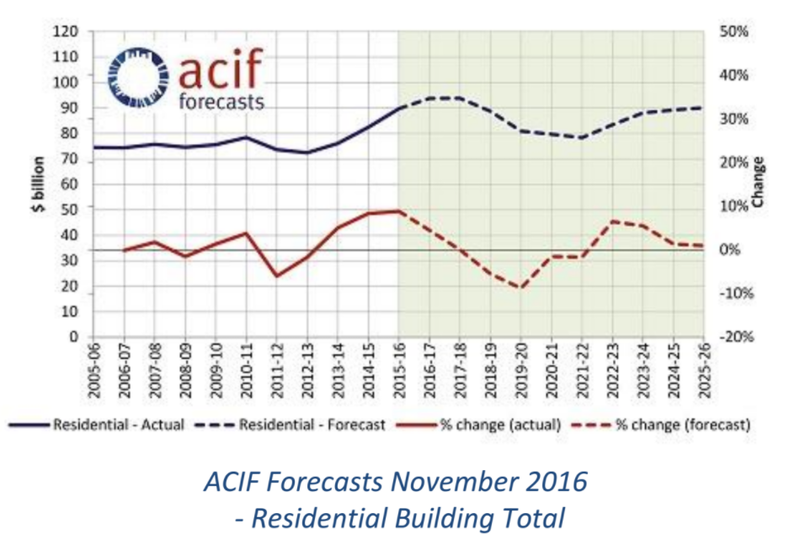 While Residential Building as a sector will continue to rise until 2017-18, from the following year, the sub sector featuring apartments and townhouses is forecast to begin a fall of up to 40%. The previous lift in Non-Residential Building and Engineering Construction from the mining boom and related activities has now completed, however the sub-sectors have new public and private investment that makes the distribution of activity uneven within each sector. The end of the mining and resources development boom has sliced the value of Engineering Construction work undertaken by a third in the last three years and the value of work undertaken has fallen to $95 billion. 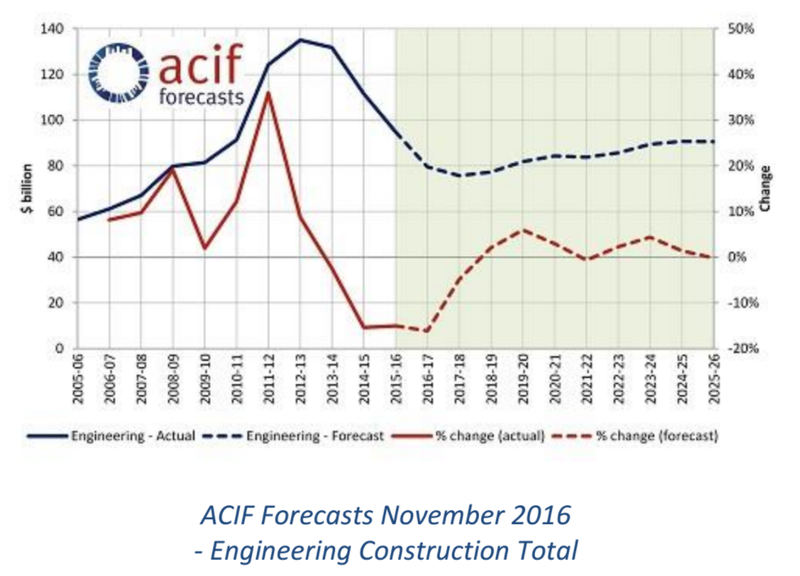 However, the November 2016 ACIF Forecasts show an increase in infrastructure spending is already underway, which has softened somewhat the decline in engineering activity associated with the resources boom. Demand in areas such as Telecommunications, Roads and Bridges, Railways and Harbours are positive, particularly in the eastern states. While further falls in overall Engineering Construction are expected this year and next as mining development and supporting infrastructure projects are completed, revised projections point to the fall coming to a halt from 2018-19. Residential Building demand reached another record level in 2015-16 and is expected to continue to climb in 2016-17, albeit at a slower pace, before beginning to descend. Reflecting concerns about a potential glut in the market and the threat that this could pose to the stability of house prices and the banking system, additional prudential controls have reduced the availability of finance to investors and to developers. There are also signs of reduced foreign demand and lower immigration is starting to impact domestic demand. As such, the much-discussed sub-sector for apartments and townhouses will see some areas facing a 40% decrease from 2018-19. The long-awaited recovery in Non-Residential Building is taking longer than expected. The prospects for this type of building work depends largely upon the outlook for non-mining business investment, and while this is improving, it is not yet enough to drive an increase in building activity until 2018-19. Particularly for this sector, concentration on the overall picture risks obscuring where the growth is coming from. Sub-sectors such as Accommodation and Other Commercial will enjoy growth next year, followed by other sub-sectors from 2017-18, in line with the activities where Australia is improving in competitiveness. The outlook for building and construction in the next two to three years is more upbeat in the more populous states, especially New South Wales and Victoria. The projected decline in Residential Building activity will arrive later in these states and will not be as deep, given underlying strength in the economy in these states and continued population growth. Non-Residential Building has been growing in these states, reflecting stronger economic fundamentals. These states are also leading the way in reinvesting in critical infrastructure. 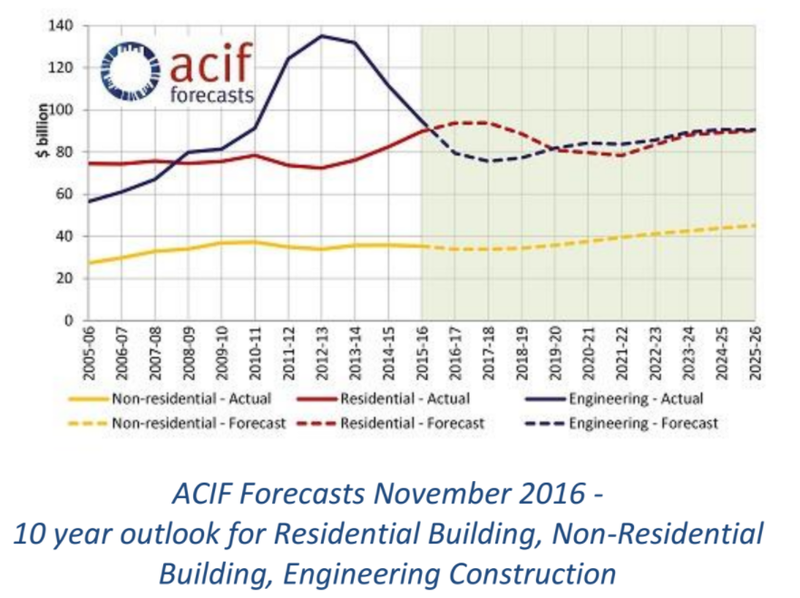 The November 2016 ACIF Forecasts project that employment in construction will fall from 2016-17 and for the next six years. The projected increase in employment in Residential Building activity in the next few years is no longer sufficient to offset the numbers of jobs lost in Engineering Construction as mining and export infrastructure projects are completed, especially in Western Australia and Queensland. The decline in employment will deepen when Residential Building activity starts to decline within the next two years.